Home » Postcards From Home » Eagle Building F. O. E.
Eagle Building F. O. E.
The Rock Island Aerie 956 of the Fraternal Order of Eagles was organized in 1905 with only 133 members. For the first three years, meetings were held at one of the large upstairs meeting halls that were common in downtown commercial buildings. Finally, in 1908, the Eagles paid $8000 for the first home of their own — the old Murrin homestead at the southwest corner of 4th Avenue and 21st Street. It was a 1-½ story house that faced 21st Street, and a porch that wrapped around on three sides. By 1913, there were thoughts of a new building. It didn’t take long. Architect Olof Cervin was retained to make drawings, the Murrin house was demolished, and the Eagles laid the cornerstone in July of 1914. Dedication of the new building quickly followed on November 17, 1915. Architect George Stauduhar may have provided a speculative design as well. Plans for an “Eagle Aerie” dated 1914 are listed in the Stauduhar archives at the University of Illinois. Costing $70,000, the new building was constructed of HyTex brick. The general contractor was Herman Hansen while the masonry subcontractor was McConochie & Sons. The copper work (all the greenish looking exterior material is copper) was fabricated by Illinois Cornice & Sheet Metal Works. The first floor had space for three stores. The original businesses represented a most unusual combination. James Normoyle installed “tournament” bowling alleys in one of the storefronts (notice the “Bowling” sign above the middle entrance). Next door, Orth Bros. opened a billiard parlor. And the corner storefront was used by August Moeller Undertaking Parlors through the mid 1930s. The best part of the building was saved for the Eagles’ use. The second floor was used as a club room, and had a “modern, sanitary” kitchen. The third floor contained a huge ballroom that was used for dances and meetings. The rear of the building even included an elevator. Formal dedication took place on St. Patrick’s Day, 1915, beginning with a parade through downtown. Marchers were variously reported as 1000 or 2000 and either three or five bands participated, including Bleuer’s Band, Murphy’s Band, and Strauss’ Band. After the parade, there were many speeches and a lady Eagle commemorated the holiday by singing a few Irish songs. In the evening, there a 6:30 pm banquet preceded ballroom dancing from 8 pm till 1 am. The Eagle Building today is remarkably like that pictured on the postcard. Some of the windows have been covered, but most appear to be original. The storefronts have been covered as well. There’s now a flagpole at the corner of the building, rather than at the rear as pictured – but the pictured one may have been an artistic embellishment from the postcard company. 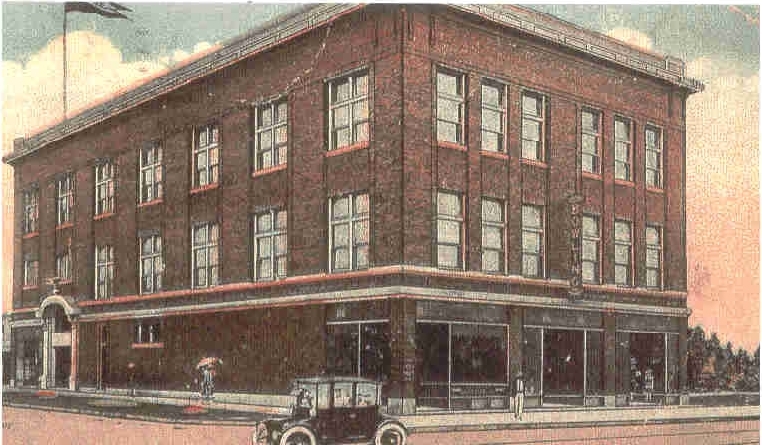 This postcard was postmarked in 1924, but was probably printed shortly after completion of the building so that it would be available at the 1916 Eagle convention held here. Reportedly the local Eagles won over Joliet in a competition to be the state convention site that year. The delegates enjoyed the Rock Island facilities and hospitality so much that two more conventions were held here, in 1920 and 1923. By 1925, the Eagles had grown to 1300 members. The aerie then purchased the adjacent lot to the west for a reported $100,000 in anticipation of expanding their building. Aerie 956 did not expand, but did remain in this building until the mid 1970s, when they moved to another building at 2827 5th Street. In 2013, the Eagles are on 11th Street. Since 1994, the building on our postcard has been owned by Jill and Yancy Bolden, who are continuing renovation and restoration. Although the building has always been structurally sound, it has needed updating and redecorating. The Boldens enjoy the beauty of this historic building and Mrs. Bolden points out that it has “awesome construction, incredible quality and great durability”. They currently operate Eagle Estate Brokers on the first floor and Eagle Reception Hall in the old third floor ballroom. This article, by Diane Oestreich, is slightly modified from the original that appeared in the Rock Island Argus and Moline Dispatch on September 23, 2001.